Here’s a recent array question from the mailing list: How do you build an array that looks like this? [0, 0, 1, 1, 0, 0, 1, 1, 0, 0, 1, 1, ...] ? When I look at that array, I see a repeating sequence of four integers, so that naturally suggests doing something with the Modulo node. 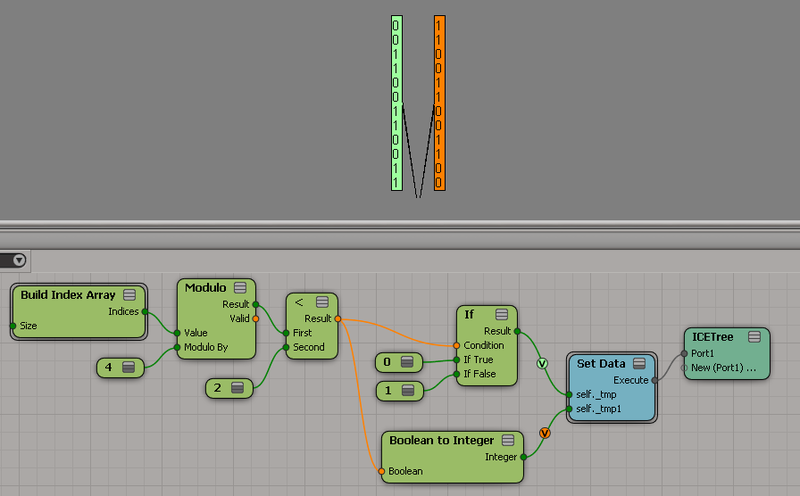 Using the If node is nice for clarity, but I could simply take the Boolean output of the comparison node. This entry was posted in ICE and tagged arrays, ICE, Modulo, Softimage by xsisupport. Bookmark the permalink.